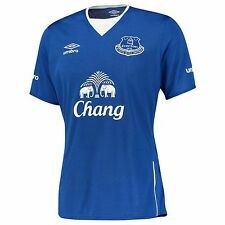 EVERTON 18/19 HOME SHIRT SIZE LARGE EXCELLENT CONDITION COMES WITH BAINES 3 ON THE BACK UK BIDDERS ONLY COULD ALL SUCCESSFUL BUYERS PLEASE LEAVE FEEDBACK WHEN ITEM IS RECEIVED. MANY THANKS! 1982 retro Everton Home Top - medium - Never worn. 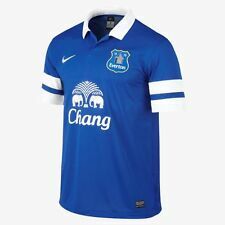 EVERTON FOOTBALL CLUB - CHANG. UMBRO FOOTBALL SHIRT. RETRO SHIRT. Umbro EVERTON 1995 FA Cup Shirt (DUNCAN FERGUSON). Features embroidered team crest and Umbro logo. 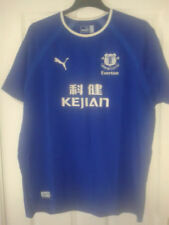 Everton shirt size large, 2012-13, ANDO 1, Nike, VGC, UK FREEPOST! Size adults large, armpit to armpit is 56cm, length 72cm. Official 2012-13 Nike item in very good condition. Club: Everton FC. Size: 12-13 Years. Features Richarlison 30 on the Back. Club: Everton FC. Size: 10-11 Years. Club: Everton FC. Colour: Blue/White. 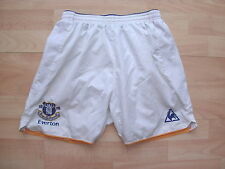 A childrens EVERTON football kit (no socks). Made by UMBRO. Nice clean condition all over. Authentic item. Club: Everton FC. Features Walcott 11 on the Back. Size: 12-13 Years. Colour: Blue. Material: 100% Polyester. Club: Everton FC. New with Defects. Size: 4-5 Years. Size: 3-6 Months. Colour: Blue. Club: Everton FC. Size: 10-11 Years.